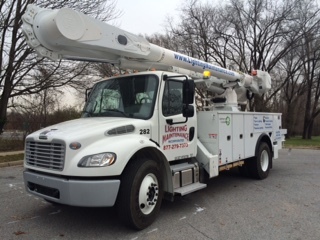 A new 60’ Altec Material Handler | Lighting Maintenance Inc.
A new 60’ Altec Material Handler arrived at LMI’s headquarters last week. This truck will be put on the road in a few days servicing several Maryland State Highway contracts. In addition we were able to push 3 trucks into retirement by adding this one into the fleet. Excellent advance for efficiency! All the vehicle lettering was designed and applied in house by our vehicle lettering team. Great Job! !